Construct a representation of controls passed to MORSE. If stateSpace does not cast to an MorseStateSpace, an exception is thrown. Get the MORSE environment this state space corresponds to. Constructor takes the state space the controls correspond to and the dimension of the space of controls, dim. Set the bounds (min max values for each dimension) for the control. Get the bounds (min max values for each dimension) for the control. Get the dimension of this control space. Copy a control to another. Check if two controls are the same. Allocate the default control sampler. Allocate memory for a control. Free the memory of a control. Make the control have no effect if it were to be applied to a state for any amount of time. Print a control to a stream. Many controls contain a number of double values. This function provides a means to get the memory address of a double value from a control control located at position index. The first double value is returned for index = 0. If index is too large (does not point to any double values in the control), the return value is nullptr. Print the settings for this control space to a stream. Perform final setup steps. This function is automatically called by the SpaceInformation. Returns the serialization size for a single control in this space. Serializes the given control into the serialization buffer. Deserializes a control from the serialization buffer. Construct a control space, given the state space. Get the name of the control space. Set the name of the control space. Get the type of the control space. The type can be used to verify whether two space instances are of the same type. Return the state space this control space depends on. Allocate an instance of the control sampler for this space. This sampler will be allocated with the sampler allocator that was previously specified by setControlSamplerAllocator() or, if no sampler allocator was specified, allocDefaultControlSampler() is called. Compute an array of ints that uniquely identifies the structure of the control space. The first element of the signature is the number of integers that follow. Check if the control space is compound. The dimension of the state space. A type assigned for this control space. The state space controls can be applied to. An optional control sampler allocator. 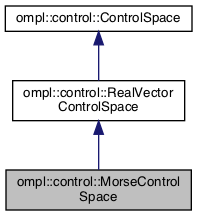 Representation of controls applied in MORSE environments. This is an array of double values. Definition at line 49 of file MorseControlSpace.h.